What do Washington, D.C., Kansas City, Mo., Baltimore, Indianapolis, and New Orleans have in common? According to a recent report, they're the best places to be if you're a woman in tech. To conduct its annual Best Cities for Women in Tech report , Smart Asset, a New York-based financial technology company, analyzed data from the U.S. Census Bureau, taking 59 of the largest U.S. cities in which the tech workforce is big enough to provide reliable data. Specifically, the study looked at the tech industry gender pay gap, income after housing costs, tech jobs filled by women, and four-year employment growth to rank each of the cities. For the third year in a row, Washington, D.C., came out on top—proving to have one of the smallest gender pay gaps in the country. The capitol city also has a relatively large percentage of female employees in tech , at about 41%. Though the study didn't delve into the reasons that D.C. and the other top cities scored so well on these four metrics, "it really shows there's something happening there," AJ Smith, vice president of content at Smart Asset, tells Fortune. According to Smart Asset, Kansas City, which came in at No. 2, has no tech industry gender pay gap. In fact, women in the city who work in technology typically earn more than their male counterparts. On average, women who have computer and mathematical jobs in Kansas City make $69,770—roughly $2,300 more than men with comparable jobs. Yet, the study found that the city is lacking when it comes to filling its growing number of tech jobs with women. In 2016, women made up about 30% of the workers in computer and mathematical roles, compared to 34% in 2014. Baltimore is ranked No. 3, according to the study—mostly because of the increase in its tech workforce in recent years. For example, of the 12,400 computer and mathematical jobs added between 2012 and 2015, women made up 32.5%—up from 28.5% in 2016, notes the study. Indianapolis and New Orleans rounded out the top five, at No. 4 and No. 5, respectively. 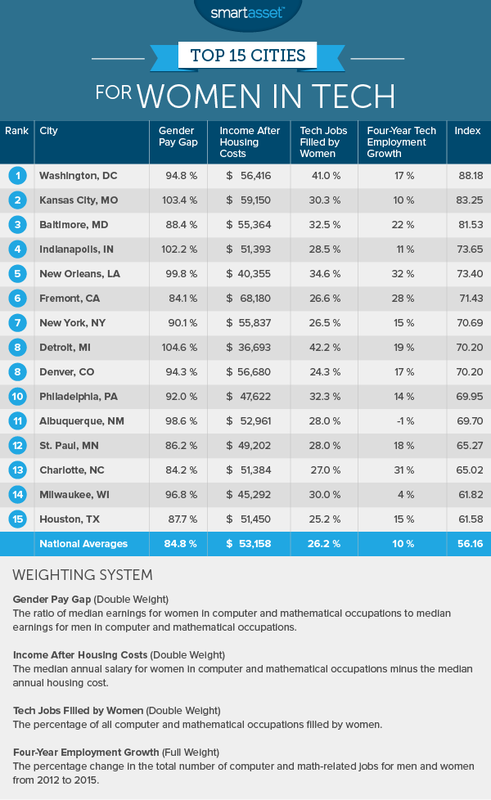 Like Kansas City, Indianapolis has no tech gender pay gap. New Orleans, meanwhile, is notable for it's job growth: the number of tech jobs in New Orleans grew by 32 percentage points between 2012 and 2015—representing the biggest four-year change in tech employment growth in the study. Although these cities may grace the top five, it's worth noting how their income after housing rates compare with those in the Bay Area, which is usually the go-to region for tech jobs. Some California cities—like Fremont, a city north of Silicon Valley, for example—boast a post-housing cost income of $68,180, nearly $12,000 more than that of D.C. But Fremont and many other other Northern California cities were dinged for their percentage of women in tech jobs. While women account for 41% of tech workers in the nation's capitol, they are only 26.6% of Fremont's technology workforce. "Women don't have to move to Silicon Valley —they can find good paying tech jobs in many areas around the country. Some of these cities should want to do better, or women will take their talents elsewhere," says Smith. While the study's results are good news for these in the top five cities, women are still in the minority in STEM—comprising only 26% of computer and mathematical jobs nationwide. And female tech workers are still being paid less than their male counterparts across the industry: On average, female-to-male tech earnings ratio in the U.S. is 84.8%—down nearly two percentage points from last year.